This flavorful dry rub is incredibly easy to prepare and works well on different cuts of your favorite venison or wild game. This dry rub is incredibly easy to prepare and works well on cuts of your favorite venison from deer, elk, moose or other game including the tenderloins, top sirloin, sirloin tip or tri-tip steaks. If you don’t want to cook the meat in a frying pan, the rub is excellent on any meat for the grill. It’s worth experimenting with the rub on your favorite wildfowl or wild game roasts, too. You can double or quadruple the ingredients for this recipe and then store it in an airtight container to use for several meals. Fresh ingredients always are best to get the optimal flavors. Enjoy! Apply a generous amount of the spice mixture to your venison and rub it in, making sure to coat all sides of the meat. Keep adding more spice until excess falls off the meat onto your cutting board. Heat two tablespoons of peanut or canola oil in a cast iron frying pan and sear the meat three minutes per side. A Camp Chef pan works wonderfully. Remove pan from heat and cover with a lid or foil. Let the meat rest for five minutes to slowly finish cooking. * Rub can be applied to meat just before cooking. For the best results rub it into your steak or roast and place it in the fridge for several hours to increase flavor transfer. 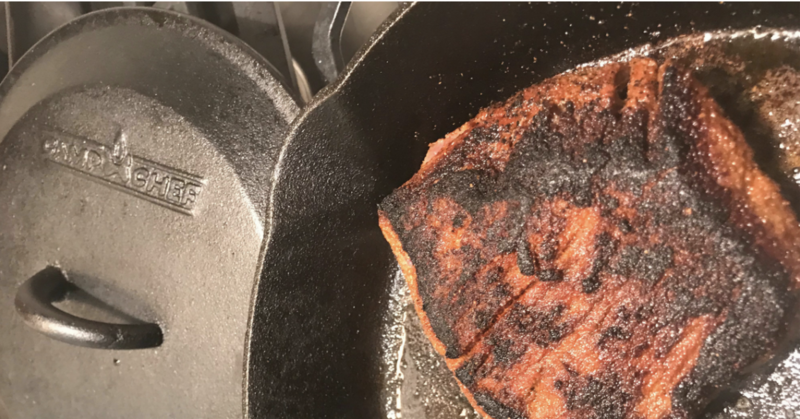 * Using a cast iron frying pan will put a heavy sear on the meat and spice, similar to a blackened seasoning. However, don’t overlook putting rubbed meat on a SmokePro or your outdoor grill.